Home > Consumer Protection > How Does the Advertising Standards Authority Help Consumers? If you’ve seen an advert on the television, in a magazine or on the radio that really gets you angry – or perhaps you see it and think ‘that can’t be true’ – there is something that you can do about it if you feel really strongly. The ASA received 26,433 complaints in 2008, which is the highest number since it was formed in 1962. 2475 advertisements were ordered to be amended or withdrawn after the ASA investigated complaints against them. What Powers Does The Advertising Standards Authority Have? 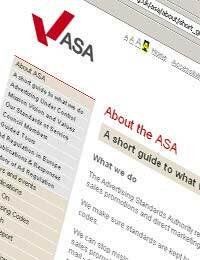 The ASA is there to protect consumers from misleading advertising in all its forms, and that includes stopping people from running adverts that it feels are misleading, harmful or offensive. It also has powers to make sure that promotions are run fairly and according to strict guidelines, as well as helping consumers resolve problems with mail order and people who send unsolicited junk mail. Some of the work that the Advertising Standards Authority has done recently includes telling a well known baby formula manufacturer not to show adverts claiming that its milk could help improve babies’ natural immune systems and help protect them from atopic dermatitis; asking a toothpaste manufacturer to change an advert stating that the effects of a brand of mouthwash lasted for twelve hours; telling a well known fast food brand to change its advert and not claim that its chicken was delivered fresh to each restaurant on a daily basis. The ASA publishes a list of recent adjudications – cases where members of the public have complained about a misleading advertisement – on its website every week, along with a list of the other work that the organisation has been doing. In addition to responding to complaints, the ASA also looks at the industry as a whole, for example looking at the issues surrounding alcohol advertising and environmental claims. They also keep a close eye on advertisements themselves, looking out for anything that they feel might breach advertising codes of practice. What are the Advertising Standards Codes? There are separate codes that apply to TV, radio and any other types of advert, with specific rules that apply to Teletext, Interactive ads and the times that TV adverts are allowed to be broadcast. The main principles behind all of the different codes are that advertisements should not mislead, cause harm to, or offend anybody. How Can You Complain to the Advertising Standards Authority? You think that there might be something misleading about an advertisement you have seen or heard. You have had problems with getting goods or a refund for anything you’ve bought by mail order or TV shopping channels. You want to stop direct mail from companies sent either by post, fax, text message or e-mail. What Happens When You Complain to the Advertising Standards Authority? If the ASA upholds a complaint that has been made about an advert, most of the time the advertiser will be asked to change their ad, or not to show it again. Most responsible advertisers agree to do this, because media owners have to agree not to run ads that breach the advertising standards codes. There will always be some people who don’t play by the rules, and for these people the ASA refer the cases to the Office of Fair Trading and Ofcom. I bought a reclining leather sofa from the co op 3 years ago. The seat has worn very badly leaving a bare patch and it is starting to happen on the other seats too. One seat is now very uncomfortable as the springs have come to the surface. One of the recliners has broken. We also had to have another reclining mechanism repaired 3 times less than 2 months after we bought it. Surely a sofa should lastlonger than 3 years?